Good luck to everyone! Don’t stress too much..it’s a small stepping stone in the grand scheme of things. SCCO Optometric Intern Mallori B. Aschenbrenner, received the highest score in the country on the National Board of Examiners in Optometry Part I Applied Basic Science Examination. 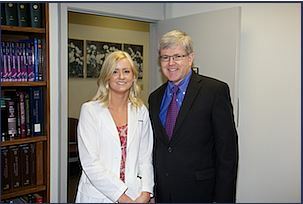 A member of SCCO’s Class of 2013, she is pictured with College President Kevin L. Alexander, O.D., Ph.D.
Mallori B. Aschenbrenner, a fourth-year optometric intern at the Southern California College of Optometry (SCCO), received the highest score in the country on the National Board of Examiners in Optometry (NBEO) Part I Applied Basic Science Examination. She has been named the recipient of the 2012 Dr. Norman E. Wallis Award for Excellence. Overall, 1,811 candidates took the exam.”Mallori’s achievement is an outstanding testament to her, to our faculty and to our educational program,” said SCCO President Kevin L. Alexander, O.D., Ph.D. “The College is indeed proud of all of our students who, like Mallori, study diligently to become exceptional providers of eye and vision care to our communities as Doctors of Optometry.”The NBEO award was established to honor Dr. Wallis’ 25 years of outstanding service as NBEO Executive Director and is given to the candidate who receives the highest score on the targeted or main Part I Basic Science Examination each year. The award consists of a personalized plaque as well as a full refund of the Part I registration fee. The Award will be presented at the Annual Meeting of the American Optometric Student Association (AOSA) by Dr. Nancy Peterson-Klein, President of the National Board of Examiners in Optometry, on June 28 in Chicago, IL. Established in 1951, the National Board of Examiners in Optometry is a private, nonprofit organization that develops, administers, and scores examinations, and reports the results, that state regulatory boards utilize in licensing optometrists to practice eye care. Licensure is a public interest, public protection regulatory function of many professions, particularly in the health professions, due to the importance of receiving competent care. In serving the public and the profession for 61 years, the National Board has compiled a distinguished record of accomplishments that include being the first national board among the doctoral level health professions to eliminate grading-on-a-curve, and one of the few national boards in any profession with a repertoire of examinations that includes conventional multiple-choice tests (single- and multiple-response items), computer-based examinations, and a clinical skills test with standardized patients at the National Center of Clinical Testing in Optometry.